Clifford H. Carlson, Machinist Mate 3/c, born Aug. 14, 1925, Duluth, MN, graduated high school and attended Duluth Jr. College. He joined the USN, Div. M, in 1943. Military stations included Farragut, ID; Bremerton, WA; Pearl Harbor; USS West Virginia until the peace signing then aboard the USS Duluth for his second trip to Japan before being discharged. Memorable experiences include being in Tokyo for the peace signing treaty, Sept. 2, 1945. 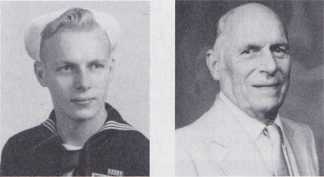 Carlson was discharged in March 1946. He received the Asiatic-Pacific w/4 stars, WWII Victory Medal, Philippine Liberation Medal w/2 stars and the American Area Campaign Medal. He and his wife, Betty Mae, have two children and four grandchildren. He retired as superintendent of transportation at Minnesota Power in Duluth. He enjoys skiing and ski patrol.